Chaz Mostert and Steve Owen bounced back from an early incident to record victory in a dramatic day for the Supercars championship contenders at the Vodafone Gold Coast 600. 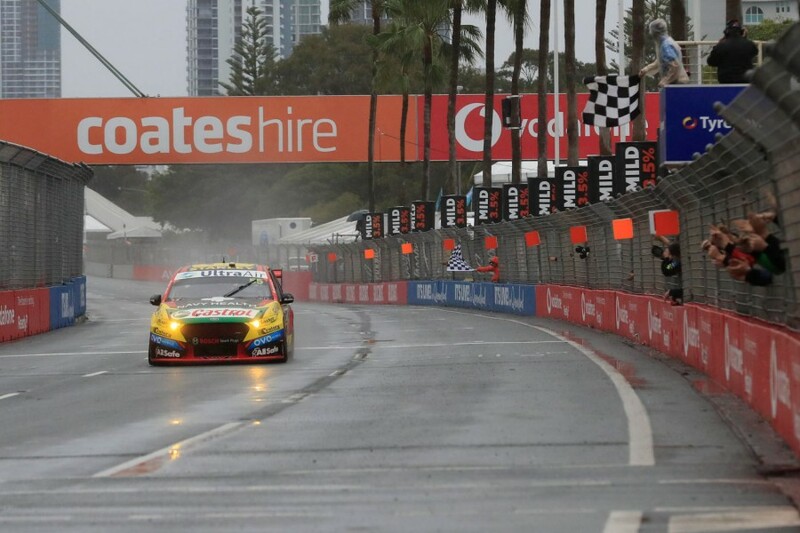 Mostert led home Prodrive team-mates Cameron Waters/Richie Stanaway at the end of a wet race that proved very much the battle of survival that had been predicted. Tim Slade/Andre Heimgartner completed the podium, having led the way until a slow second pitstop handed the advantage to the Ford squad. Mostert is now just 121 points from championship leader Fabian Coulthard, who finished 19th after a late penalty, and alongside Owen also takes over the PIRTEK Enduro Cup lead. Jamie Whincup and Scott McLaughlin also endured major setbacks, but were able to close to within 37 and 76 points of Coulthard respectively in the overall title fight. "This place’s been kicking me, year after year," said Mostert, who had scored his first pole of the campaign earlier in the day and now moves to three wins for the season. "I really wanted to get the surfboard [trophy] this year, but it’s even better to get the win. I would’ve settled for third but the car was lit today. "Steve-O got taken out and we still got up there, he was doing an awesome job. It’s awesome to share the position on the top step of the podium with him." Despite the co-drivers not having run in the wet prior to the race, just one car – the #62 Lucas Dumbrell Motorsport entry – started with its primary driver aboard. Lining up third behind Owen and Dumbrell, Heimgartner was the star of the early laps, picking off the Red Bull Holden and Supercheap Ford on laps six and eight respectively. The Kiwi drove into the distance throughout the remainder of the first stint as Dumbrell struggled to find a way around Owen. 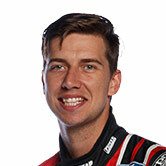 Heimgartner’s margin stood at 15 seconds on lap 29 when Dumbrell locked a left-front into Turn 1 and clanged into Owen, sending the Falcon spinning. Stanaway – who had charged from 14th on the grid – snuck through to second, with Dumbrell third and Owen rejoining behind Dean Fiore in fifth. Dumbrell was handed a 15-second penalty for his troubles, to be served at the upcoming pitstop, while remarkably the two cars continued undamaged. The co-drivers filed out of the cars soon after the lap 34 minimum was reached – Slade with a 15s lead over Waters once the cycle was complete. Garry Jacobson held third through the middle stages while off-sequence, Prodrive having pitted him from sixth on lap 15 to avoid double stacking after carving through from 22nd. Mostert took over the Supercheap Ford in a net sixth, but immediately passed Craig Lowndes, Whincup and then Michael Caruso as he faced a 30-second deficit to leader Slade. The second stops came early thanks to the race's one and only Safety Car on lap 56, called to retrieve a tyre bundle pushed onto the circuit by Lee Holdsworth. Slade was the loser, dropping behind Waters and Mostert when the uneven pit surface caused the left-rear jack on the Freightliner car to fail to fully lift the Holden off the ground, making for a slow tyre change. Once the race restarted, Mostert wasted little time taking the lead, scything down the inside of Waters at Turn 4 on the second racing lap before building a comfortable margin. The top three held station until the end, Mostert taking the flag 2.5s ahead of Waters, with Slade a further three seconds back in third. The race ultimately reached its time cut-off after 94 of the 101 laps – the duration already reduced by one lap after a second warm-up lap was granted to help the co-drivers assess the track conditions. Shane Van Gisbergen climbed his way from eighth to fourth in the final stint, demoting Nissan's Caruso to fifth on lap 80. The #97 Holden had been at the back of the top 10 after co-driver Matt Campbell’s stint, which included losing three places when he ran wide at the treacherous Turn 11. Whincup finished sixth having failed to make an impression during the final stint, while team-mate Lowndes was seventh. Coulthard took the flag 10th before being demoted to 19th thanks to a 15-second penalty for tagging Nick Percat into a spin at Turn 11 on lap 74. The left-hander proved a nightmare for Shell V-Power Racing, with Alex Premat having spun the #17 entry he shared with Scott McLaughlin at the corner on lap five. Premat also had a brush with the Turn 3 barrier in his first stint, before McLaughlin drove a solid – if unspectacular – final two stints to salvage 12th after his team-mate's penalty. Eighth for Mark Winterbottom/Dean Canto came despite a drive-through penalty for The Bottle-O Ford being released into the path of the sister Supercheap entry after its first stop. Winterbottom charged from 14th after the Safety Car restart and had enough margin to be able to take a trip down the Turn 11 escape road in the closing stages without losing a place. Ninth for Jason Bright/Jacobson completed Prodrive’s strong day, with Super2 regular Jacobson having shone during his double-stint. It was a tough day for Garry Rogers Motorsport, with both cars turned around during the race, including Garth Tander copping a high-speed hit on the run to Turn 1 from Todd Kelly. Kelly’s Nissan clouted the wall after striking Tander, putting the Carsales Altima out of the race. Tander continued undamaged and finished 13th. It was a horror day for Bathurst winners David Reynolds and Luke Youlden, who started 23rd and finished 17th. Youlden cut his way through to 16th on the opening lap, but the Penrite Holden suffered right-side damage when it clipped the stranded Premat on lap five. Although continuing without issue, the team was unable to open the drivers’ door on the Penrite Holden at the pitstop, losing time as the driver change took place via the window.